It's easy for us to wonder why some sorcerers go bad, but then again, most of us have never cast a single spell in our lives. The allure of dark magic is pretty strong. 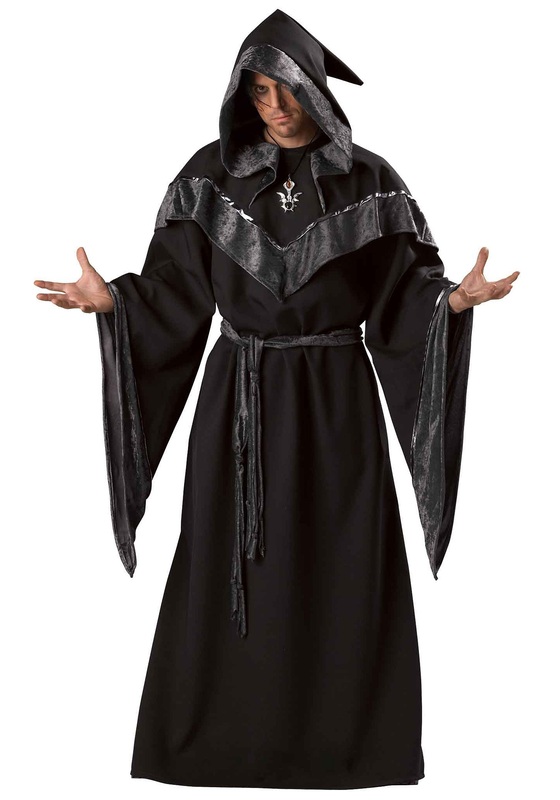 See if you can resist its pull with this Dark Sorcerer Costume, or maybe you'll decide to fully embrace it, instead. Magic is a difficult game to get into, and we're not talking about the card game (but that can be tricky, too). We're referring to making a living as a sorcerer. Many professional magic-users live for a very, very long time, so the turnover rate isn't high. If you manage to secure a position in the arcane arts, you're expected to keep producing new spells and potions, and publish your research on a regular basis. It can be a lot of pressure, so naturally they may start focusing on flashier dark magic to meet deadlines. It doesn't take long, though, to completely give into the dark side once you've had a taste of it. Another part of wielding such wicked power that makes it so addictive is the wardrobe. Dark wizards get to wear much cooler robes than the lame-looking rags good little wizards wear. The flowing, hooded robe included with this costume is made of luxurious grey velvet, and the fashionable silver trim gives it a mystical quality. It also comes with a matching medallion, to help you channel your sinister powers. You can decide for yourself if being a dark sorcerer is easier than being good, but after wearing this costume, you just may find out the darkness is more fun!